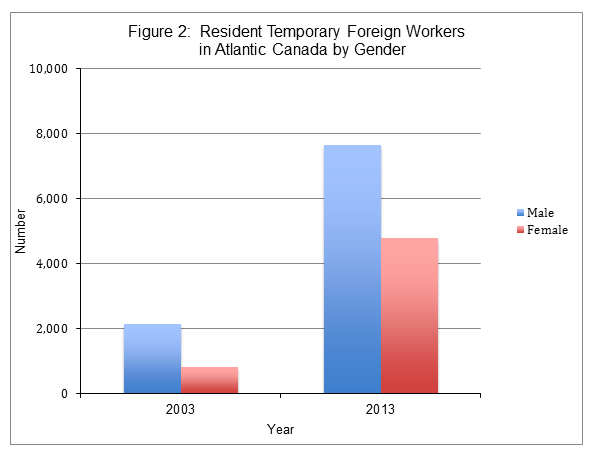 Between 2003 and 2013, the number of TFWs entering Atlantic Canada rose by about 88 percent. Although the number of female temporary workers remains below that of males, their growth has been faster (more than 3 times over the period) than that of males (whose numbers grew by less than double). Figure 1 plots the number of TFWs arriving each year. In 2003, there were 2,980 TFWs resident in the region, 39 percent of them being females. In 2013, there were 12,413 TFWs residing in the region and females comprised 38 percent of them. Figure 2 plots their numbers in the two years. The United States, the United Kingdom and Philippines were the top three source countries of TFWs coming to Atlantic Canada in 2003 and 2013. However, Malaysia and India, which occupied fourth and fifth positions in 2003, were replaced by Peoples Republic of China and Jamaica in 2013 (Table 1). There was a greater change over the period in the top five source countries of TFWs who were present in the region. Philippines replaced United States in 2013 as the top source country while Peoples Republic of China and India replaced Australia and Norway (Table 2). In 2003, about 80 percent of TFWs entered Atlantic Canada to work in higher-skilled occupations(occupation levels classified as O, A and B). In 2013, there was a shift in this occupational distribution towards lower-skilled occupations (occupational levels C and D). This change was more prominent for females than for males (Table 3). Among the top five destinations of TFWs, Halifax, Saint John’s and Saint John maintained their rankings as number 1, 2 and 4, respectively, in 2003 and 2013. Moncton moved up from fifth to third position while Charlottetown replaced Fredericton in the list.